Casa Loma’s history is almost as interesting as the man who had the castle built it back in 1914. Nestled on a hill, looking down on the city of Toronto in Canada, this castle was constructed with a specific purpose in mind. Major-General Sir Henry Pellatt commissioned the gothic-revival building in the hopes that when royalty visited from England, they’d stay with him in the 98-room residence. Casa Loma translates to “house on a hill” from Spanish. Not only did he pour money into what must have looked to be an endless black hole of building work, he also spent it on stonemasons who he brought from Scotland. Sir Henry oversaw the three-year building project that employed up to 400 tradesmen. The building is said to have cost $3.5 million at the time. Which, of course, reminds me of Winchester House in California, that cost a whopping $5.5 million to build around the same time. But he and his wife Lady Mary lived in their castle for just nine years before they fell into financial difficulties and were forced to sell it. From then on, the Casa Loma history and fortunes have changed quite a few times. It’s first reincarnation came as a hotel before it was turned into a nightclub, of all things. But it would soon fall into disrepair and its future was in the hands of the people of Toronto. 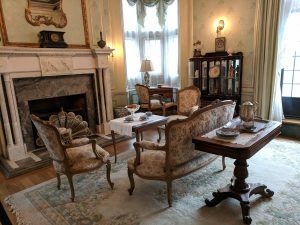 A long-term lease was granted and work began to finish off the Great Hall and Billiard rooms after Sir Henry and Lady Mary moved out and sold most of their furniture and belongings. The hotel was opened in 1927 and you could stay there for $6 a night, but it closed in 1929 during The Great Depression. 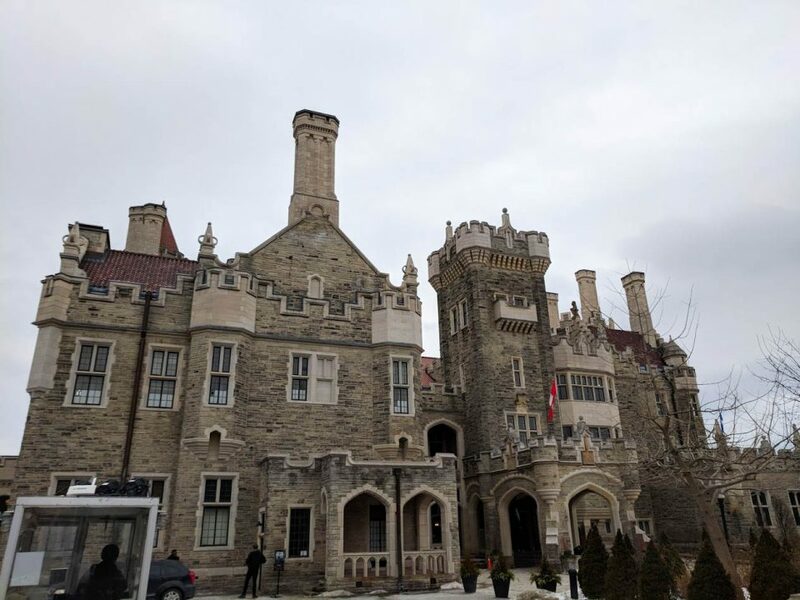 Plans to expand the castle to include two more wings with hotel rooms were scuppered when a syndicate from New York offered to buy Casa Loma. The deal fell through. The nightclub era was what I imagine a classic late 1920s party to be – complete with lindy and swing dancing. And I’m probably not far off, if you check out this film of Glen Gary and the Casa Loma Orchestra playing. The Detroit big band played at the castle for eight months over 1927 and 1928 under the name Orange blossoms. The nightclub served them well because they changed their name soon afterwards and went on a tour of North America. Despite the success of the band, Casa Loma still couldn’t attract any buyers, so it sat dormant for a few years, until the tax man stepped in. 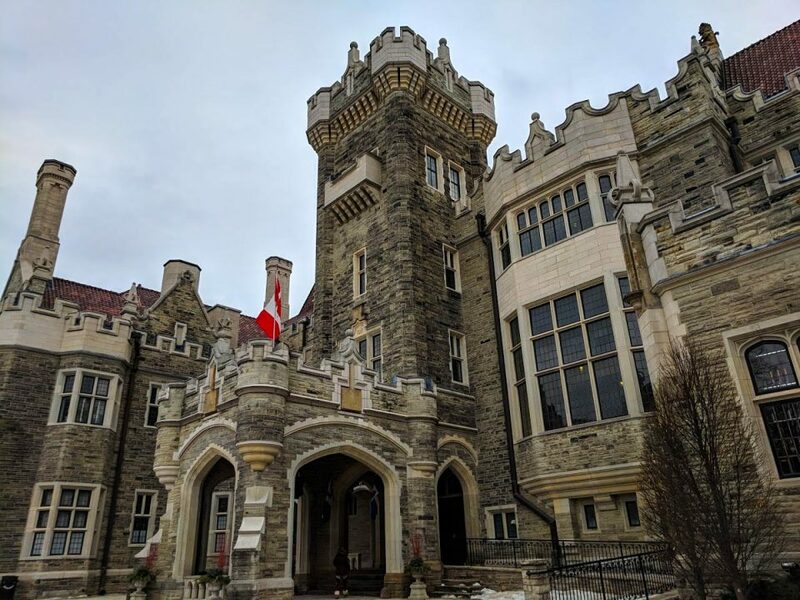 After racking up just over $27,000 in property taxes, the City of Toronto seized the castle, but by then it was falling into disrepair after being neglected for so long. 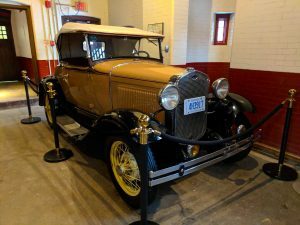 The City sat on the building for four years until it was leased out as a tourist attraction, with tours going at the rock-bottom price of 25 cents. That works out to be about $4.40 in 2018 money. 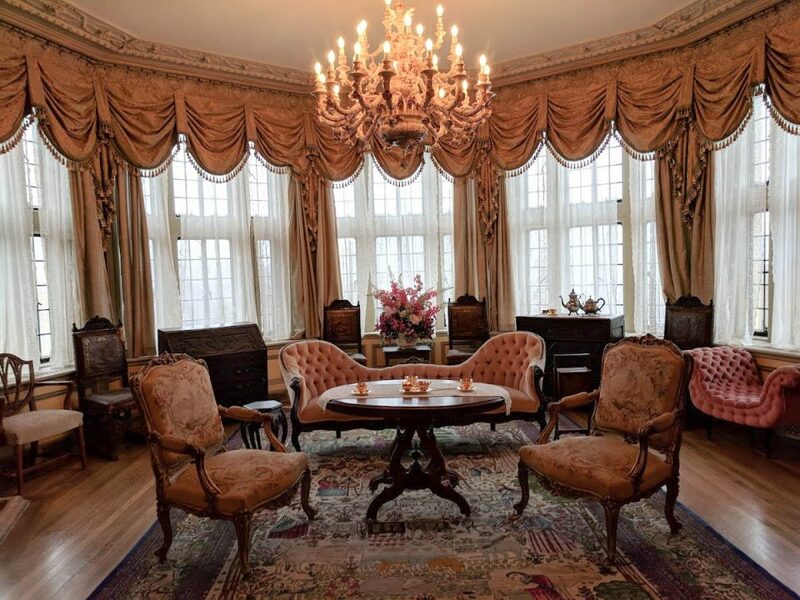 There’s not just one room with a view at Casa Loma. From the Norman tower you can see out to Toronto. It trumped suggestions from the public for the building’s use, which included turning it into a war veteran’s convalescence home, a high school and art gallery among many others. The City of Toronto still owns Casa Loma today and has leased out the day-to-day running. 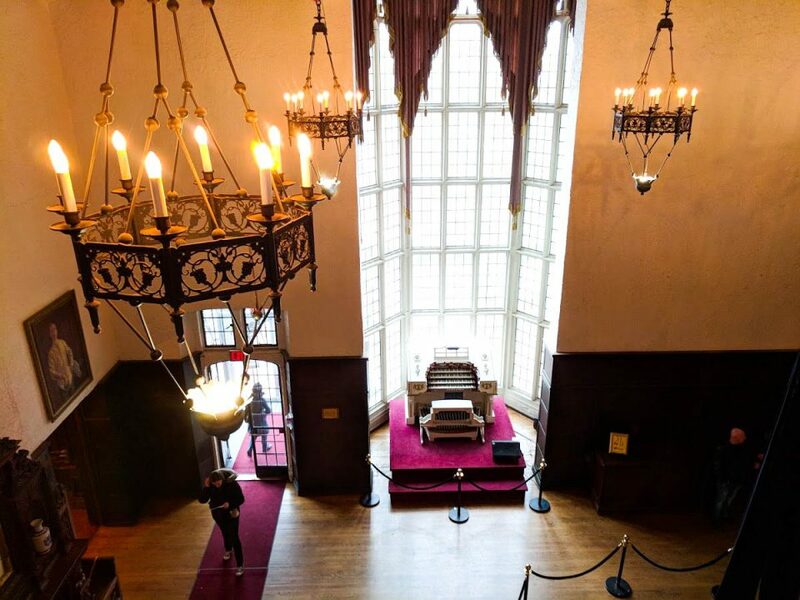 You can visit Casa Loma and take an audio tour of the four floors of beautifully-appointed rooms. As I found out on my visit, the castle is a popular spot for weddings and other functions. Casa Loma is truly a sprawling building. With a long tunnel leading under the road from the castle to the part of the grounds where animals, gardening sheds and the cars were kept. I’d recommend spending at least half a day exploring – there is plenty to see and if you visit in spring or summer you can also take advantage of the beautiful gardens. Major General Sir Henry Mill Pellat was a Canadian financier and soldier. He made his fortune by bringing hydro-electricity to Toronto and investing in Canada’s railways. He joined the Queens Own Rifles in 1876 and was made a Knight Bachelor in 1905 by King Edward VII for his service. Lady Mary was also born in Toronto and the pair married in 1882. She was made the Chief Commissioner of the Canadian Girl Guides movement in 1912, and she became a great patron to them. Once the couple’s fortunes were lost they moved to their country farm, King Hill, where Lady Mary died of heart failure in 1924. I only had a few hours before closing on a Saturday afternoon to traverse the hallways and peer into all the nooks and crannies. Instead of talking about each room one-by-one, I’ll give you the highlights and let you explore the rest for yourself. Walking through the main entrance, you’ll come into the Great Hall. If you want an audio tour (which I highly recommend), head downstairs to the basement to pick one up. The Great Hall is decorated sparsely because the organ pipes take precedence. The Great Hall is overlooked by a balcony from Sir Henry’s bedroom, and is decorated very simply with wooden panels, a few focal chandeliers and a Wurlitzer organ. The building’s first Legge organ ended up costing $75,000 and had to be auctioned off to pay mounting debts before even a note was played. The Wurlitzer that now replaces it has 1,500 pipes and the Toronto Theatre Organ Society, which maintains the instrument, hosts six performances a year on it. Four organ performances and two silent films. The Casa Loma Wurlitzer organ is put to use six times a year. 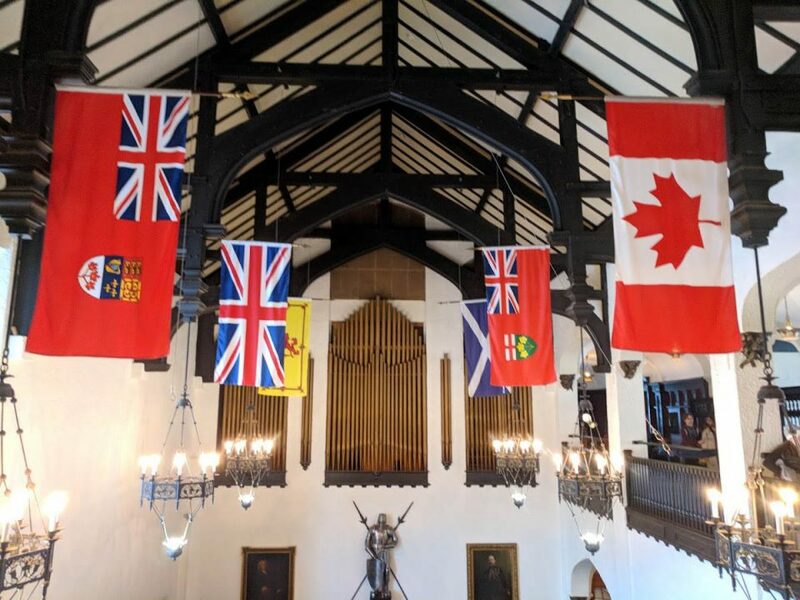 The Great Hall’s 60 foot (18 metre) ceilings make the room feel much bigger than it is and I was lucky enough to see an aerialist demonstration the day that I visited. Through an archway off the Great Hall is one of my favourite rooms – a beautiful lounge area that has a tongue-in-cheek surprise waiting for you. On one wall hangs a large, elaborate portrait of Canada’s current monarch, Queen Elizabeth II in her younger days. Facing her on the opposite wall, the king of Purple Rain, Prince, brandishes a rapier from his spot over the fireplace. The Great Hall features Queen Elizabeth II’s portrait. 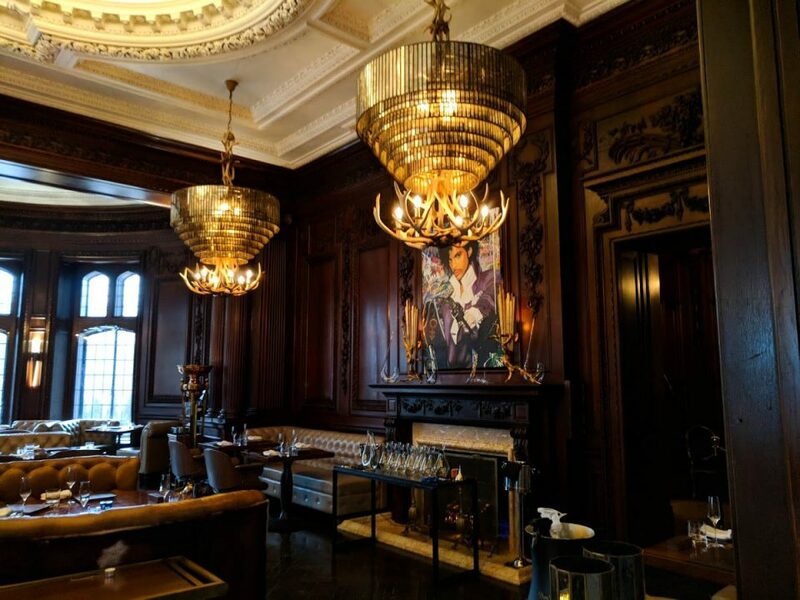 Two Monarchs of our time reign supreme over a room built for fun and frivolity – filled with leather and wood, intricate ceiling moldings and chandeliers finished with antlers. And of course US music royalty, Prince. 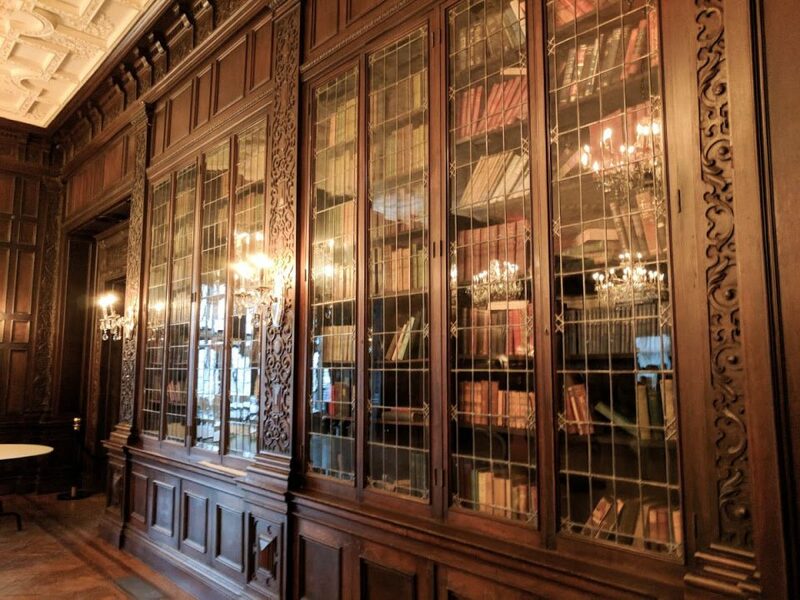 Book lovers, feast your eyes on The Library! 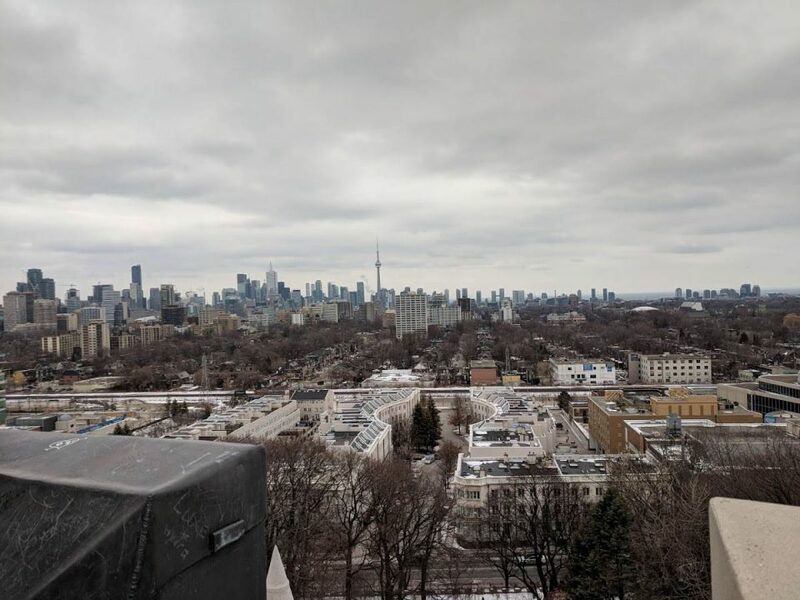 Lined with walls of glass cabinets, The Library holds hundreds of tomes and the windows look out onto the terrace, gardens beyond and the city of Toronto as a backdrop for it all. If you can drag your eyes away from the impressive book collection, look down at the herringbone oak floor and then up at another intricate ceiling to locate Sir Henry’s very own coat of arms. Just a tiny taste of the Casa Loma Library. Just leave me here please. The Conservatory, at the opposite end of the castle to The Great Hall, boasts Italian marble beneath your feet and Ontario marble on the walls. You might wonder how a room with so much cold marble and such large windows can house so many plants during Toronto’s cold winters. The answer is steam pipes. They line the flower beds to keep the plants at a toasty temperature while snow blankets everything outside. 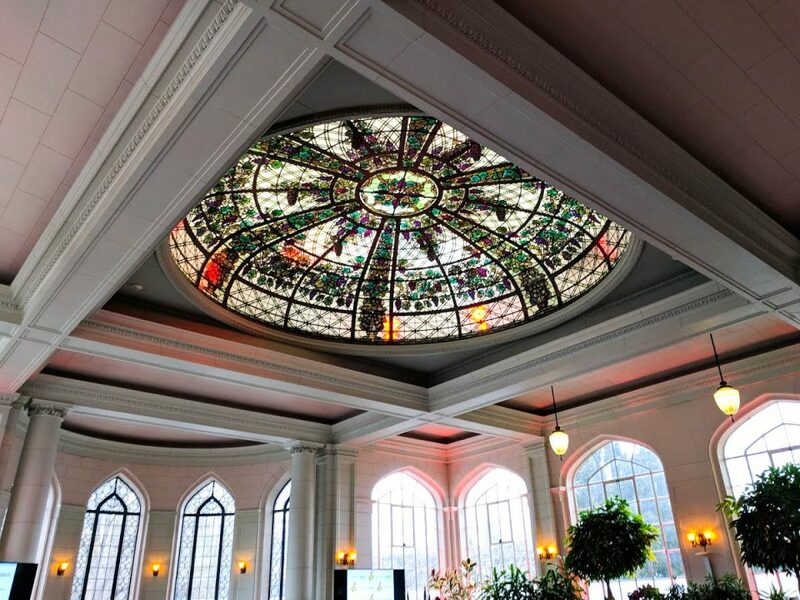 The stained glass domed skylight really is a sight to behold here. The stained glass skylight in the conservatory filters coloured light onto the Italian marble below. 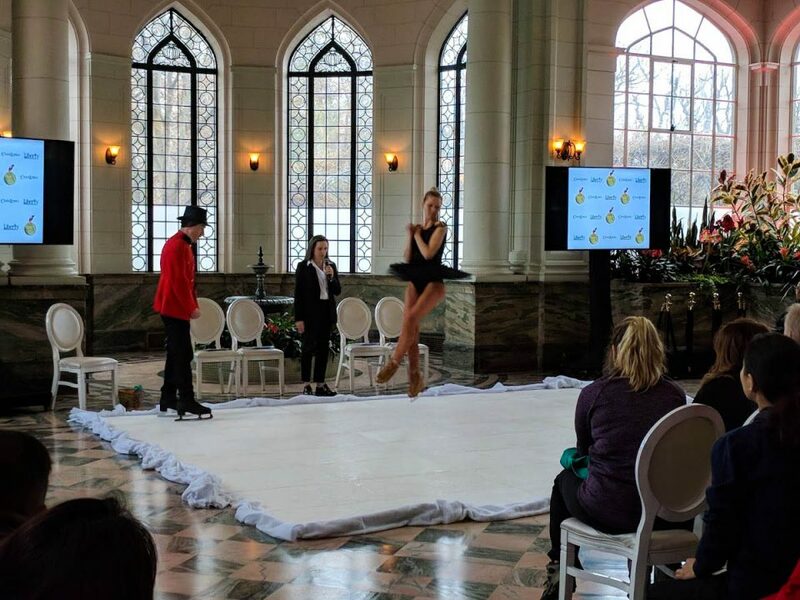 I visited during the 2018 Winter Olympics on a weekend where Casa Loma was holding a similarly themed weekend. We were treated to a figure skating demonstration and explanation of how the sport is judged and how much work goes into coming up with the perfect routine. 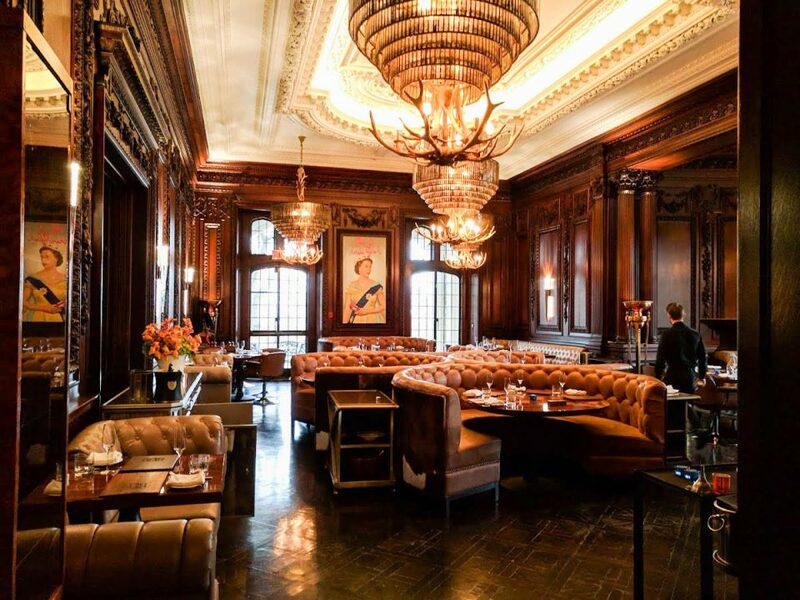 The Dining Room is lined with Circassian Walnut, which was sourced from England. It features swirls in shades of brown with black streaks here and there. Now we get to Sir Henry’s study, where an exact replica of Napoleon’s writing desk took pride of place. 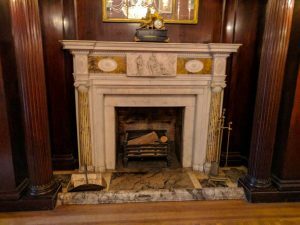 The Edwardian-style office has walnut-lined walls and a marble fireplace with carvings depicting Hercules. Two secret doorways shadow the fireplace at either end. One leads to Sir Henry’s sleeping quarters, while the other winds down to the basement level. The family’s living quarters were up on the second floor – where Sir Henry and Lady Mary both had bedrooms, bathrooms and entertaining areas. Frankly, with the addition of a kitchen they could have both lived very comfortably within these rooms and probably not see each other for days. 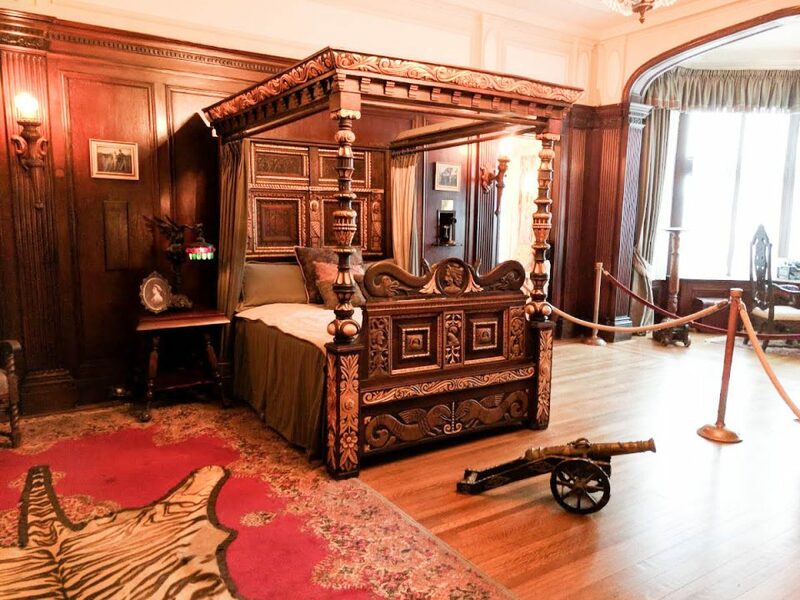 The Windsor Room, named for the British Royal family, was built as quarters for them, should they or any nobility ever visit Casa Loma. The seatee, bed and chairs in this room are the same furniture purchased by the Pellats for the room. The burning question is, did royalty ever make it to these rooms? It took a little digging, but it turns out that while no reigning monarch ever even visited Casa Loma. However, Duke of Windsor Edward VIII, who famously abdicated the throne to marry American actress Wallis Simpson, visited the castle twice. The Windosr Room bed was carved in Venetian Style and has a lacquered and gilded frame. The seetee and chairs reflect elements of the Louis XV style of decoration and were sold at auction for $95 each. 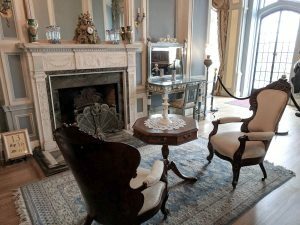 Sir Henry’s suite is actually smaller than Lady Mary’s, which was common at the time. 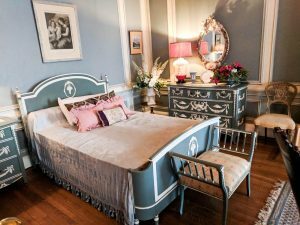 If you’re looking for a way to bridge the gap in masculine and feminine decorating, maybe separate bedrooms are for you and your significant other. While his suites were fairly plain, you cannot escape the masculinity on show. The walls are clad in mahogany and walnut and there’s even a secret compartment near the fireplace where he stored important documents. None of the furniture in this room is original, except the phoenix lamp on the nightstand. Looking for a room that screams masculinity? Sir Henry Pellat has you sorted. 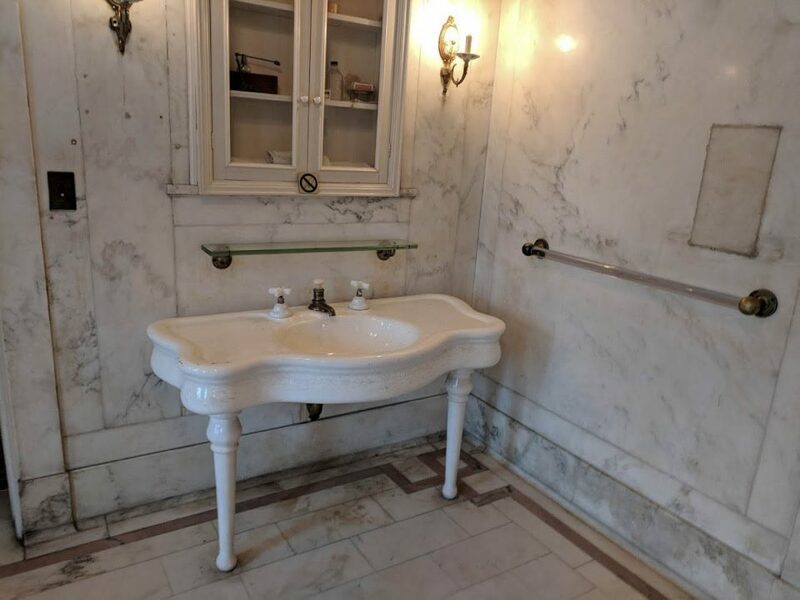 Moving onto Sir Henry’s bathroom, which seemed to be a feat of modern engineering at a time when many were still using bedpans and outhouses. His shower consisted of six taps that controlled three levels of pipes, designed to spray the body from different heights. The room is clad in marble, as it was considered hygienic at the time, and the whole set up cost $10,000 at the time. By the way, this bathroom, is easily the size of a San Francisco studio apartment. Can you sense my jealousy? I may have forgotten to take a photo of Sir Henry’s shower. So here’s his sink instead. 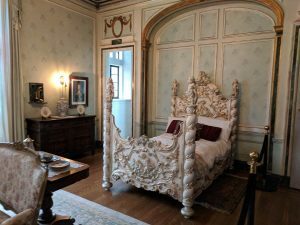 Lady Mary’s suite was bigger and dare I say prettier than her husband’s and was made up of a sitting room where she entertained guests, bedroom, bathroom, solarium, wardrobe and a balcony overlooking the grounds. The pale blue that adorns the walls was Lady Mary’s favourite – Wedgewood Blue. Even back in the early 1900s, companies were naming colours for themselves. 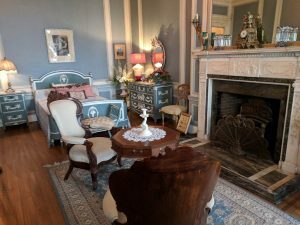 Most of the furniture in these rooms is original. By the end of their tenure in the castle, Lady Mary was confined to a wheelchair so her husband had an elevator installed for her. 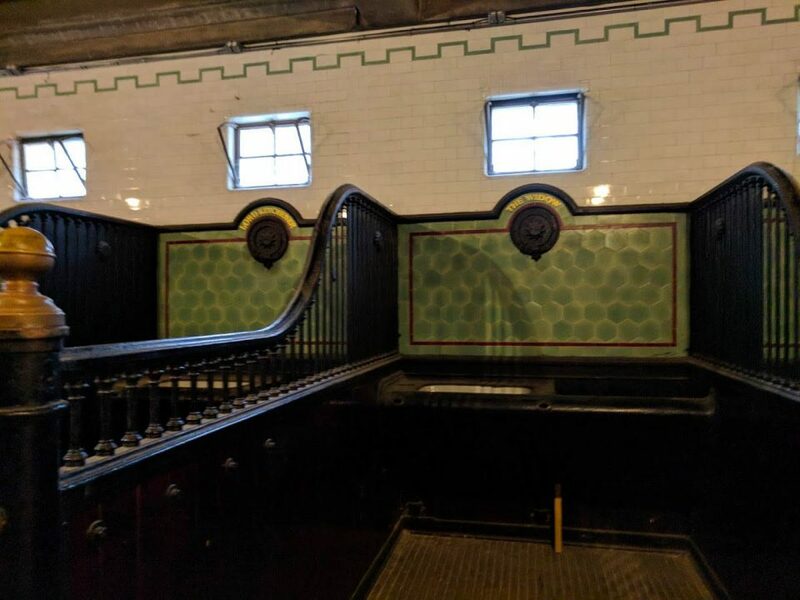 It was the first electric elevator to be put into a private home in the city. Even Lady Mary’s bed was Wedgewood Blue. The Round Room is so named because it’s built into the base of one of the castle’s towers. That meant that all the windows and doors had to be curved to fit the uniquely-shaped room. Designed in the style of late 18th century Scottish architect Robert Adam, the neo-classical plaster work features floral decals, and urns. The Round Room is one of the more beautifully appointed rooms at Casa Loma. I’ll leave most of the third floor exploration to you. It is dedicated to the Queen’s Own Rifles infantry regiment, of which Sir Henry was a Major General. Most of this floor serves as a museum to the QOR but it also houses the stairs up to the Norman and Scottish towers. Tell them apart by their shape – the Norman tower is square, while the Scottish tower is rounded. Both towers provide views of the city beyond and the grounds below. You can step outside on the rooftop of the Norman tower, but you’ll have to be content with looking through the windows of the Scottish. Both have a fairly narrow flight of steps leading up to them. 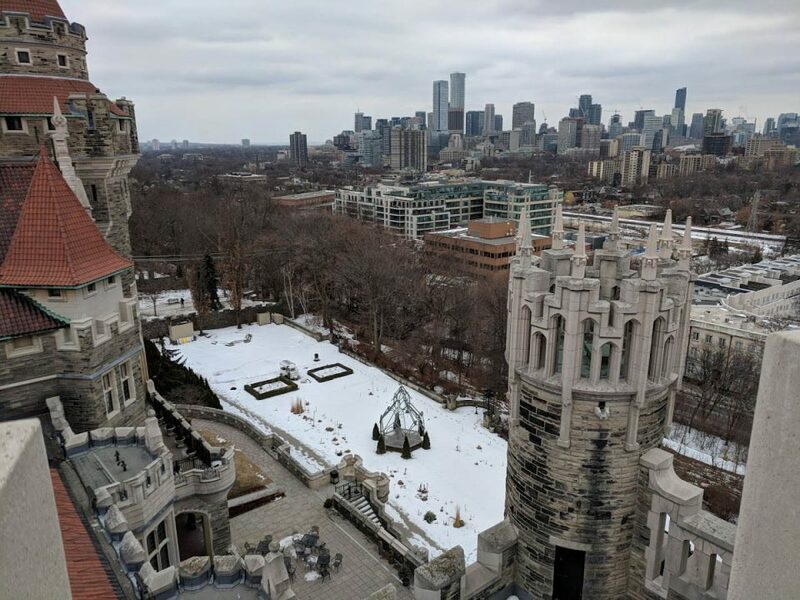 The view from the Norman Tower of Casa Loma. This is where things get interesting. 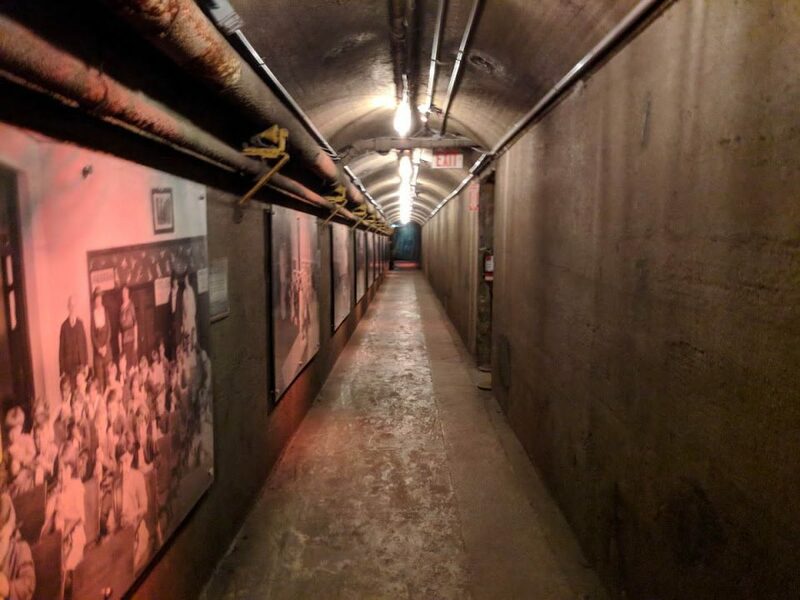 The basement below the Great Hall is now the cafe (it used to be Sir Henry’s exercise room) and gift shop and also features a hallway full of posters of films that have had scenes shot at the castle, adding to the Casa Loma history. To the right of the gift shop though, is the wine cellar, where almost 1800 bottles of wine and champagne were chilled by pipes filled with ammonia and brine. 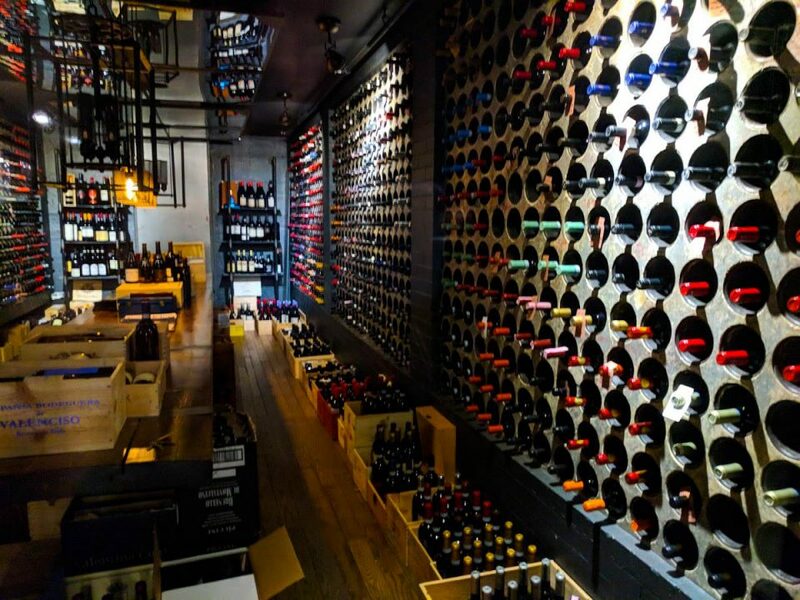 Now this is a proper wine cellar. You’ll never run out of the good stuff. You’ll find an 800 foot (243 metre) tunnel down here, that leads under a road and over to the stables, garage and gardening building. It’s said that the tunnel is haunted and that strange noises have been heard and people’s hair pulled while walking it. I remained mercifully unscathed during my solo jaunt through the WWII-bunker style tunnel. During World War II, the Canadian Royal Navy had an assembly plant here for an early form of sonar, which detected submarines. The factory’s whereabouts was only disclosed after the war had ended. Feeling a little spooked in here? I don’t blame you. This tunnel stretches for 200 metres. The stables were designed and built long before the castle was. EJ Lennox designed them in 1906 and they are said to have cost $250,000 to put up. When you visit you’ll see why. The stalls are fashioned out of Spanish mahogany and the floor tiles are set in a zig zag pattern to allow the horses to have some grip. And each has a brass plaque bearing the names of its horse. Apparently they were so well polished that rumours started to spread that they were actually made of 18 carat gold. Sir Pellat’s favourite horse was named Prince and was a charger who was used during military exercises and parades. Sir Henry was a master equestrian and loved his horses. 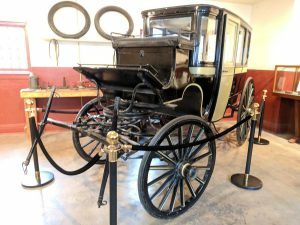 If you’re a fan of antique cars, make a beeline for the carriage room and garage. 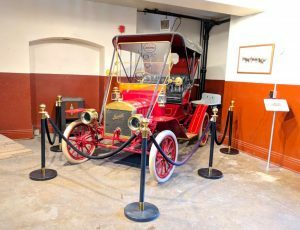 Here you’ll find an exhibit of vintage automobiles dating back to the early 1900s. Since I know less than nothing about cars I’ll leave it at that. To sate Sir Henry’s love of gardening during the winter, the Potting Shed was built. It was where he’d cultivate rare and exotic varieties of orchids and chrysanthemums, which would go on to win prizes at local flower shows. 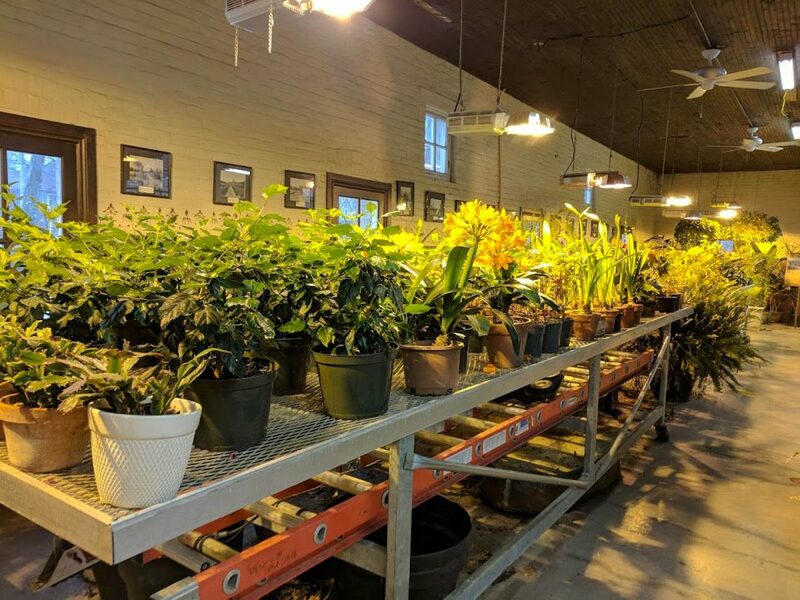 In the winter, the plants would be moved from their greenhouses into the conservatory. The potting shed was one of Sir Henry’s favourite places. Opening hours: Daily between 9.30am and 5pm although the last admission is at 4.30pm. It is closed on Christmas Day. Cost: Adults 18-64 $30, Seniors 64+ $25, Children 4-13 $20, toddlers under 4 are free. Parking onsite costs $10. No discount for buying online, however you can purchase here. Getting there: Take the tram to Dupont Station and walk two blocks north to the castle. It’s easy to get to however it is up a steep hill and some stairs that don’t accommodate strollers. That’s looks fabulous – how crazy that they put in an ice rink!! I thought they were ballet dancers at first. Then I saw properly! They spent some crazy amount of money having that tiny ice rink put in for that weekend. It was pretty cool though! How beautiful and thank you for all the detailed photos and information on the history of the castle. I am such a history nerd, I love visiting places like these. Then reliving it all when I write about them. What a magnificient building and I just drooled over all your photos. 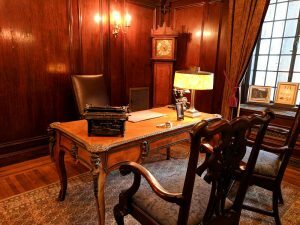 Thanks for sharing this gorgeous Casa Loma and it’s history. Haha, I’m glad you liked the photos! I had so much fun wandering around and hearing all about the place. Wow. Looks amazing. I’d probably get lost in there. I’m sure you could spend days in there exploring. Fantastic photos and history. Yep, I would have also gotten lost in there if not for the map. As it was, I found myself in the same rooms a few times. Hey, I recognized this place. It’s in my home city 🙂 Thanks for writing about it on your blog and the lovely photos. I love that you are a history nerd. I spend some time thinking about what life must have been like back then in any historical place I visit. 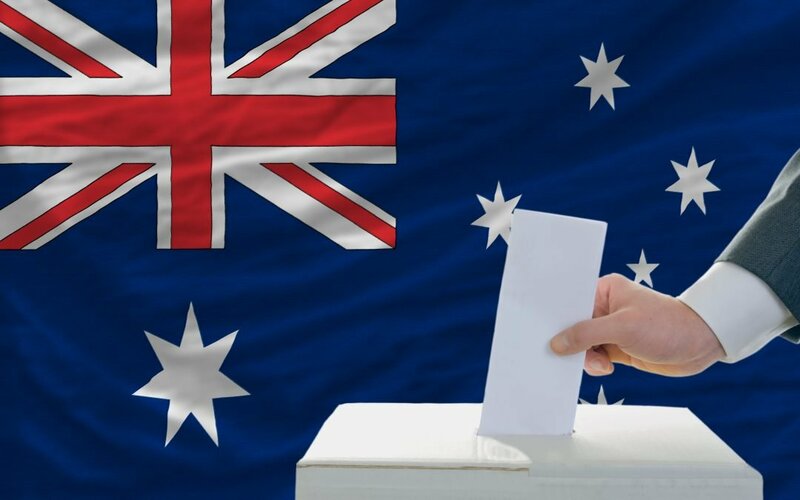 Especially for me, is to visit Old Parliament House in Canberra to see how small the VIP offices and rooms were and to recall some of the decisions taken back then. At my age, I can remember the events of things like the Dismissal so well. What a stunning house! 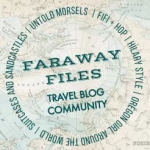 I feel all Downton Abbey after reading this, and seeing those great photos. The Grand Hall is stunning, and so classic and elegant in feel too. Thanks for sharing this amazing house. Wow what a stunning place! I didn’t know Toronto had this. Definitely adding it to my list of things to do when I finally make it up there! When I was a kid I loved the book “The Lost Treasure of Casa Loma” (it’s kind of famous in Canada, at least for those of us born in the 1980s!). Your photos bring my childhood reading to life! 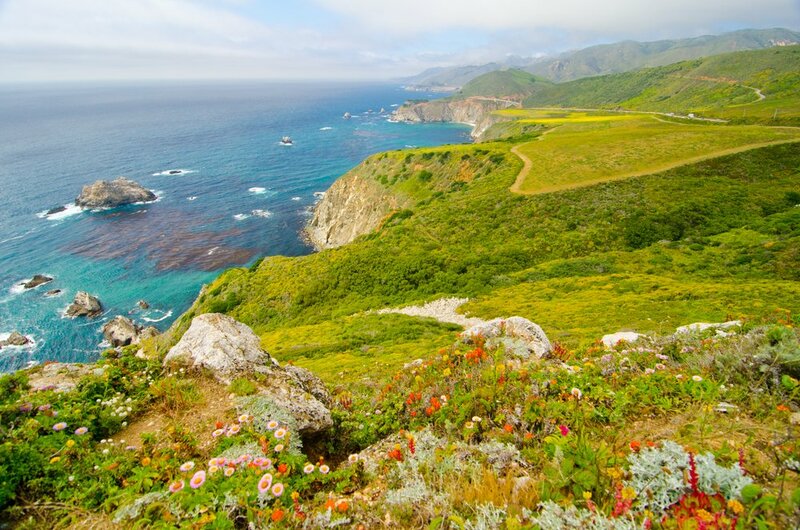 This place looks beautiful! Life is ironic. The castle built for royalty ended up being a nightclub? So crazy! The house reminds me a bit of Hearst Castle (have you been?). The exterior is different but there are some similarities on the interior. 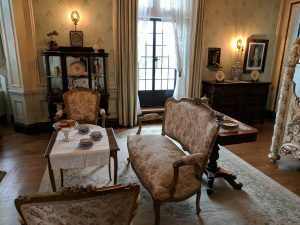 The history behind Casa Loma is Tragic and interesting. What an extraordinary interior!! Loving the remote view from the Norman tower . Lot to explore!! Wow! The castle looks amazing, with incredible history too. Great to hear that the it’s being used now as a tourist attraction and a place for events and weddings. Would be a waste if it was left alone and gone in disrepair. Personally, I could spend hours enjoying the library and browsing through its collection! Have slowly been trying to plan a trip to Toronto and this will definitely have to be added to my itinerary! Fascinating history. 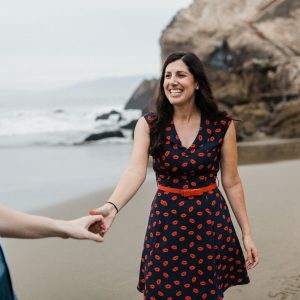 The owners may not have achieved their original objective directly, but their castle certainly makes everyone else who visits feel like royalty. There are literally too many rooms in that places that Im lusting after right now! So beautiful– I wish I could have gone to a party there during the 20s!! And *drool* over that library! I want one in my house! Casa Loma is one of my fav places in Toronto! Your post and photos bring back a lot of memories from my college days! WOW. What a place – being Scottish I have a bit of a castle radar, when I saw this I thought it looked very like a Scottish castle and then you explained the stone masons 😉 That wine cellar is the absolute dream also!! Not sure how many Scottish castles have wine cellars – wine doesn’t last long enough around us haha!! It looks like an incredible place to visit and you captured it so well. Like Lauren, I too sensed a Scottish link when I saw the first photo. It reminds me of castles in Scotland and even my husband’s old school in Edinburgh. We visited Culzean Castle a couple of years ago – it was designed by Robert Adam so I can see his influence in the curved Round Room. I wish we had seen Casa Loma when we were in Toronto some years ago – every thing about it appeals to me and I love that skylight. Those rooms look so grand! So much history behind this place – I can imagine it as a club! Oh how fabulous! Thank you for the virtual tour. Now I’m so disappointed we didn’t make it to Casa Loma when we were in Toronto… But I’ll add it to the list for next time!